Purveyor of Vintage Books & Pop Culture Memorabilia for Over 24 Years! Any and all models featured in the photos on or in these books are at least eighteen years of age. Please note that all photos or illustrations of a graphic or explicit nature have been censored. Softcover. Illustrated. 192 pages. SRP: $4.95. Softcover. Illustrated. 216 pages. SRP: $4.75. Book is Near Mint Minus. Preface by Dr. Ronald Banks. Softcover. Illustrated. 160 pages. SRP: $7.50. Book is Fine Plus save for store sticker upper left corner front cover. Book is Fine save for small .5" stain on back cover. Softcover. Illustrated. 160 pages. SRP: $4.75. This rare edition contains both volumes, previously published separately. Softcover. Illustrated. 432 pages. SRP: $5.95. Softcover. Illustrated. 192 pages. SRP: $7.50. Softcover. Illustrated. 176 pages. SRP: $5.95. Softcover. Illustrated. 198 pages. SRP: $7.50. Book is Near Mint save for date written in pen on back cover. Softcover. 192 pages. SRP: 75p. Softcover. Illustrated. 160 pages. SRP: $4.25. Book is Very Fine save for clean hole punch upper right corner front cover. Foreward by Sameul Wolman, M.D. Book is Very Good Plus. Softcover. Illustrated. 182 pages. SRP: $5.95. Book is Very Fine Minus. Foreward by Guy A. Hayman. Softcover. Illustrated. 216 pages. SRP: $3.95. Softcover w/ Dust Jacket. Illustrated. 160 pages. SRP: $15.00. Dust Jacket is Very Good. Hardcover w/ Dust Jacket. 132 pages. SRP: $5.00. Softcover. Illustrated. 432 pages. SRP: $4.75. Softcover. Illustrated. 192 pages. SRP: $3.95. Softcover. Illustrated. 202 pages. SRP: $4.95. Softcover. Illustrated. 208 pages. SRP: $4.75. Softcover. Illustrated. 158 pages. SRP: $4.75. Softcover. Illustrated. 158 pages. SRP: $7.50. Softcover. Illustrated. 168 pages. SRP: 12/6. Softcover. Illustrated. 214 pages. SRP: $4.75. Softcover. Illustrated. 190 pages. SRP: $4.75. Softcover. Illustrated. 252 pages. SRP: $5.95. Includes photographs of exclusively black models. Book is Very Fine save for hole punch upper right corner front cover. Softcover. Illustrated by J. Frederick Smith. 96 pages. SRP: $7.95. Softcover. Illustrated. 160 pages. SRP: $4.95. Includes over 60 explicit photographs, eight of which are in color. Softcover. Illustrated. 158 pages. SRP: $4.25. Foreward by Guy A. Sanders. Softcover. Illustrated. 192 pages. SRP: $4.75. Softcover. Illustrated. 180 pages. SRP: $4.75. Book is Very Fine Plus. Hardcover w/ Dust Jacket. 284 pages. SRP: $14.95. Book is Near Mint save for book plate on interior cover. Softcover. Illustrated. 224 pages. SRP: $4.75. Book is Near Mint save for some creasing/crushing upper right corner front cover. Softcover. 192 pages. SRP: 15s. Limited "Not for Sale: Privately Printed for the Trade" Edition. Note: 5.25" x 3.25" x .5" format. 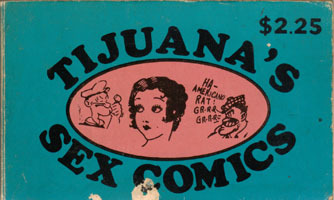 Includes reproductions of the fourteen earliest known Tijuana Bibles in existence. Some of the characters spoofed include Alley Oop, Batman & Robin, Popeye and Superman. Softcover. Illustrated. 166 pages. SRP: $4.75. Book is Very Fine save for 1" crease on upper left corner back cover.